Louis XIV, King of France, was born at Saint Germain-en-Laye on the 5th of September 1638. His father Louis XIII, had married Anne of Austria, daughter of Philip III king of Spain, in 1615, but for twenty years the marriage had remained without issue. The childlessness of the king was a constant threat to the policy of his great minister Richelieu for the king's brother and heir, Gaston of Orleans, was a deter mined opponent of that policy. The birth of the prince who was destined to reign as Louis XIV was therefore hailed as triumph, not less important than any of those won by diplomacy or arms. The death of his father made Louis XIV king on the 14th of May 1643, but he had to wait sixteen years before he began to rule. Power lay for some time in the hands of the queen-mother and in those of her minister, Cardinal Mazarin who found it difficult to maintain the power of the throne and the integrity of French territory during the domestic trouble of the Fronde and the last stages of the Thirty Years' War. The minister was hated as a foreigner, and the childhood of the king weakened the royal authority. Twice the court had to flee from Paris; once when there was a rumor of intended flight the populace was admitted to see the king in his bed. The memory of these humiliations played their part in developing later the autocratic ideas of Louis. Mazarin, in spite of all disadvantages, triumphed alike over his domestic and his foreign opponents. The Fronde was at an end by 1653; the peace of Westphalia (1648) and the peace of the Pyrenees (1659) marked the success of the arms and of the diplomacy of France. Louis XIV was now twenty-one years of age and was anxious to rule as well as to reign. The peace of the Pyrenees was a decisive event in his personal history as well as in that of France, for one of its most important stipulations referred to his marriage. He had already been strongly attracted to one of the nieces of Mazarin, but reasons of state triumphed over personal impulse; and it was agreed that the new friendship with Spain should be cemented by the marriage of Louis to his cousin, the Infanta Maria Theresa. A large dowry was stipulated for; and in consideration of this the king promised to forgo all claims that his wife might otherwise possess to the Spanish crown or any part its territories. The dowry was never paid, and the king held himself free of his promise. The marriage took place at once, and the king entered Paris in triumph in 1660. Mazarin died in the next year; but so strong was the feeling that the kings of France could only rule through a first minister that it was generally expected that Mazarin would soon have a successor. The king, however, at once announced his intention of being his own first minister; and from this resolution he never swerved. Whatever great qualities he may have lacked he certainly possessed industry and patience in the highest degree. He built up a thoroughly personal system of government, and presided constantly over the council and many of its committees. He was fond of gaiety and of sport; but neither ever turned him away from the punctual and laborious discharge of his royal duties. Even the greatest of his ministers found themselves controlled by the king. Fouquet, the finance minister, had accumulated enormous wealth during the late disturbances, and seemed to possess power and ambition too great for a subject. 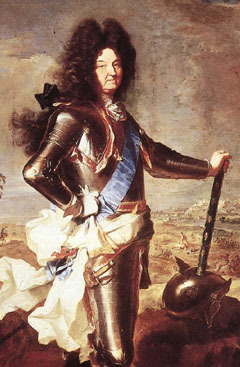 Louis XIV found it necessary almost to conspire against him; he was overthrown and condemned to perpetual imprisonment. Those who had most of the king's confidence afterwards were Colbert for home affairs; Lionne for diplomacy; Louvois for war; but as his reign proceeded he became more self-confident and more intolerant of independence of judgment in his ministers. His court was from the first one of great brilliance. In art and in literature, the great period, which is usually called by the king's name, had in some respects passed its zenith when he began to reign. But France was unquestionably the first state in Europe both in arms and arts, and within France the authority of the king was practically undisputed. The nation, proud of its pre-eminence and weary of civil war, saw in the king its true representative and the guarantee of its unity and success. Louis was singularly well fitted by his physical and intellectual gifts for the role of Grand Monarque and he played it to perfection. His wife Maria Theresa bore him children but there was no community of tastes between them, and the chief influence at court is to be found not in the queen but in the succession of avowed mistresses. Mademoiselle de la Valli�re held the position from 1662 to 1670; she was then ousted by Madame de Montespan, who had fiercely intrigued for it, and whose proud and ambitious temper offered a great contrast to her rival. She held her position from 1670 to 1679 and then gave place to the still more famous Madame de Maintenon, who ruled, however, not as mistress but as wife. The events that brought about this incident form the strangest episode in the king's private life. Madame de Maintenon was the widow of the dramatist Scarron, and first came into relationship with the king as governess to his illegitimate children. She was a woman of unstained life and strongly religious temperament; and it was by this that she gained so great an influence over the king. Through her influence the king was reconciled to his wife, and, when Maria Theresa died in 1683, Madame de Maintenon shortly afterwards (in 1684) became the king's wife, though this was never officially declared. Under her influence the court lost most of its gaiety, and religion came to exercise much control over the life and the policy of the king. The first years of the king's rule were marked by the great schemes of Colbert for the financial, commercial, industrial and naval reorganization of France, and in these schemes Louis took a deep interest. But in 1667 began the long series of wars, which lasted with little real intermission to the end of the reign. In the steps that led to these wars and in their conduct the egotistic ambition and the vanity of the king played an important part; though he never showed real military skill and took no share in any military operations except in certain sieges. The War of Devolution (or the Queen's War) in 1667-68 to enforce the queen's claim to certain districts in the Spanish Netherlands, led to the Dutch War (1672-78), and in both these wars the supremacy of the French armies was clearly apparent. The next decade (1678-88) was the real turning point in the history of the reign, and the strength of France was seriously diminished. The chief cause of this is to be found in the revocation of the Edict of Nantes. The church had always opposed this settlement and had succeeded in altering it in many points. Now the new religious zeal and the autocratic temper of Louis XIV came to the support of the church. The French Huguenots found their privileges decreased, and then, in 1685, the edict was altogether withdrawn. The results were ruinous to France. It was not only that she lost many thousands of her best citizens, but this blow against Protestantism deprived her of those Protestant alliances in Europe which had been in the past her great diplomatic support. Then the English Revolution came in 1688 and changed England from a wavering ally into the most determined of the enemies of France. The war with the Grand Alliance, of which King William III was the heart and soul, lasted from 1688 to 1697; and the treaty of Ryswick, which brought it to an end, deprived France of certain territories on her frontier. But Louis saw in the Spanish question a chance of more than making up for this loss. The Spanish king Charles II was dying, and the future of the possessions of Spain was doubtful. The astute diplomacy of Louis succeeded in winning the inheritance for his grandson Philip. But this involved France and Europe in an immense war (1700) and by the peace of Utrecht (1713), though the French prince retained the Spanish crown, France had again to make concessions of territory. Louis XIV had shown wonderful tenacity of purpose during this disastrous war, and sometimes a nobler and more national spirit than during the years of his triumphs. But the condition of France was terrible. She was burdened with debt; the reforms of Colbert were ruined; and opposition to the king's regime began to make itself felt. Peace brought some relief to France, but the last years of the king's life were gloomy in the extreme. His numerous descendants seemed at one time to place the succession beyond all difficulty. But his eldest son, the dauphin, died in April 1711; his eldest grandson the duke of Burgundy in February 1712; and his great-grandson the duke of Brittany in March 1712. The heir to the throne was now the duke of Burgundy's son, the duke of Anjou, afterwards Louis XV. The king died on the 1st of September 1715, after the longest recorded reign in European history. The judgment of posterity has not repeated the flattering verdict of his contemporaries; but he remains the model of a great king in all that concerns the externals of kingship.